Leverage IBM Maximo for efficient Enterprise Asset Management (EAM) to operate and manage your enterprise assets including plant and production, infrastructure, transportation, real estate and facilities. Talk to our Maximo Experts Now! We have partnered with IBM to provide you with best practices that enhance your services, reduce costs, improve productivity and address challenges. In effect, we help you to identify opportunities, optimize resources, and mitigate risks. We follow an engagement model that brings out the best of your asset utilization. Our experts help to deliver customized implementation plans based on enterprise-specific needs. We connect Maximo to the enterprise’s systems and applications. We help in scaling up your systems based on your needs. Our specialists provide ongoing development, maintenance and administrative assistance. Our experts help in test case automation and functional testing. Gain near Real Time Visibility into Asset Usage! We provide enterprise asset management on a single consolidated platform to improve the productivity of all types of transportation assets such as trucks, buses, cars, locomotives, etc. This goes a long way to help in reducing maintenance cost and improving asset lifecycle. We offer services across the entire retail spectrum, encompassing technology platforms and customer segments. Our holistic solutions seek to improve various facets of retail operations—from supply chain management to business intelligence. Cutting-edge solutions for the services sector to optimize their delivery and to provide a seamless omnichannel experience to customers. We provide integrated asset management solutions for building customer engagement at all levels. We help organizations to manage production equipment, facilities, and infrastructure on a single platform. Using Maximo, we help you to improve asset analysis, facilitate continuous improvement, reduce manual intervention, standardize procedures and do a lot more. Maximo Anywhere is a new mobile solution for Maximo developed on IBM Mobile First platform. Maximo Mobile Suite is a set of solutions to provide remote access to the Maximo Asset Management processes for work, asset and inventory management. Maximo Everyplace offers to use Maximo from supported mobile devices and smartphones with a web browser. 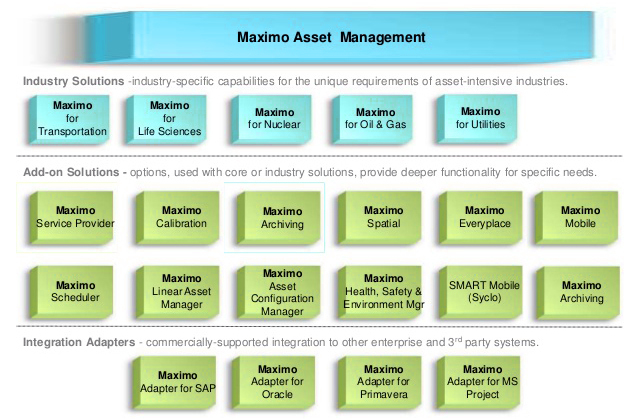 Maximo Enterprise Adapter for SAP supports rapid integration of Maximo Asset Management with SAP R/3 or my SAP ERP apps. Other Integrations options for business applications Maximo integration framework provide options (Web services, interface tables) to be able to integrate with any other applications.